MELBOURNE, Australia, March 19, 2014 (ENS) – The Japanese whaling fleet has left the waters of the Antarctic Treaty Zone, ending whaling in the Southern Ocean Whale Sanctuary for this season, according to data from the whale defense organization Sea Shepherd Australia. Early Tuesday morning, the Automatic Identification System signal of the Nisshin Maru was picked up shortly before the Japanese factory vessel crossed 60° South latitude. The Nisshin Maru is on a northerly course with its destination set for Japan, and arrival scheduled in about three weeks. 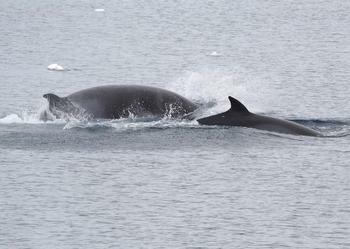 In the 10 years of Sea Shepherd’s Antarctic whale defense campaigns, this is the first time that the whalers have activated their AIS while still in their self-allocated whaling grounds. In the past they have kept their locations secret to avoid interception by the Sea Shepherd conservation ships. “I am immensely proud of our efforts, keeping the whalers on the run, and disrupting illegal operations for the entire whaling season,” said Chakravarty. Since the Nisshin Maru was last seen fleeing on March 2, Sea Shepherd ships The Bob Barker and The Steve Irwin have swept across and occupied the only good weather areas that were available to the whalers this late in the season. During this time, the Nisshin Maru has been accompanied by only one harpoon ship. This has further hampered the ability of the whalers, adding to the woes of their already disastrous season. On Tuesday, the Yushin Maru No. 2 and the Yushin Maru No. 3 began dropping away from their positions tailing the Sea Shepherd whale defense ships, indicating that the whalers were low on fuel and unable to tail the Sea Shepherd ships any further. The Bob Barker and The Steve Irwin then began running northwards to the boundary of the Antarctic Treaty Zone, to push the Nisshin Maru out of the whale sanctuary. 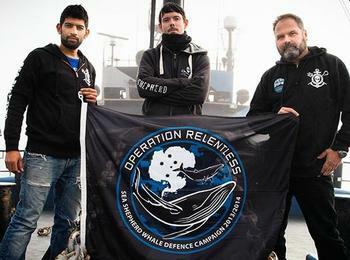 Since first locating the whale poachers on January 5, the Sea Shepherd Fleet has actively pursued the Japanese whalers, locating the Nisshin Maru on a record four separate occasions over the three-month period. The whaling fleet’s operations were hampered by Sea Shepherd’s continual pursuit, which included twice exposing the whalers in the process of butchering protected minke whales, taken from the waters of the Southern Ocean Whale Sanctuary. The Southern Ocean Whale Sanctuary was established by the International Whaling Commission in 1994 with 23 countries supporting the agreement and Japan opposing it. The International Whaling Commission imposed a global moratorium on commercial whaling in 1986 to allow the world’s whales to recover after centuries of whaling had brought many species to the brink of extinction. Nevertheless, the Tokyo-based Institute of Cetacean Research, which manages Japan’s “research whaling” in the Antarctic and elsewhere, says the whaling fleet is conducting “a perfectly legal activity carried out under the International Whaling Convention for the Regulation of Whaling. “Sea Shepherd actions threaten safety of our research ships and lives of crews on it and is therefore unacceptable,” says the ICR. The International Whaling Commission does require that the flesh of whales killed for research not be wasted. 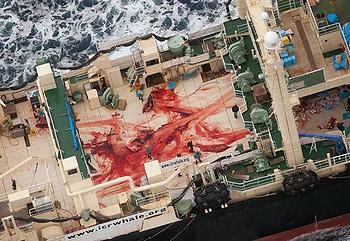 Japanese companies sell the whale meat for food. The outcome of Australia’s legal bid to end Japanese Antarctic whaling is to be announced at the end of this month. Australia is suing Japan at the International Court of Justice, claiming that the whale hunt is not a scientific program, but is outlawed commercial whaling. The case was begun by the first government of Prime Minister Kevin Rudd in 2010 and has been backed by subsequent governments. The International Court of Justice said it would deliver its judgment in The Hague on March 31. Judgments of the court have binding force and cannot be appealed. This is the latest that the Sea Shepherd Fleet has remained in the Southern Ocean to intervene against Japanese whalers. The three Sea Shepherd ships are also returning to port. The Sam Simon sailed into its homeport of Williamstown, Melbourne, on Saturday to a warm welcome. The Bob Barker is now headed to Wellington, New Zealand. The Steve Irwin will return to Hobart to honor Sea Shepherd Chairman and Co-Campaign Leader for Operation Relentless, Bob Brown, formerly a Member of the Australian Senate. Both ships are scheduled to make their respective ports around March 22.